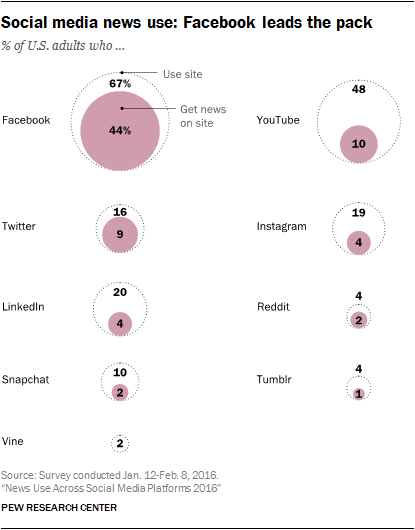 1 About four-in-ten Americans now often get news online. Digital is currently second only to TV news as the most prominent news platform. Nearly twice as many adults (38%) often get news online than get news in print (20%). Younger adults are especially likely to turn to the web for their news, while older Americans rely heavily on TV for their news. Print newspapers are still relatively popular among older Americans, but very few younger Americans say they read them often. 2 Mobile is becoming a preferred device for digital news. The portion of Americans who ever get news on a mobile device has gone up from 54% in 2013 to 72% today. Two-thirds (66%) of Americans get news on both desktop/laptop and mobile, but more of those prefer mobile (56%) than desktop (42%). 3 Long-form journalism has a place in today’s mobile-centric society. 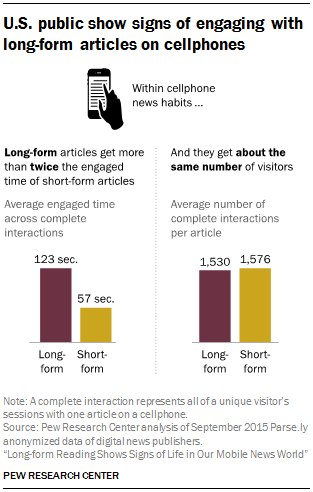 Cellphone users spend more time on average with long-form news articles than with short-form. In fact, the total engaged time with articles 1,000 words or longer averages about twice that of the engaged time with short-form stories: 123 seconds compared with 57. And on average, long-form content attracts about the same number of visitors as short-form content. 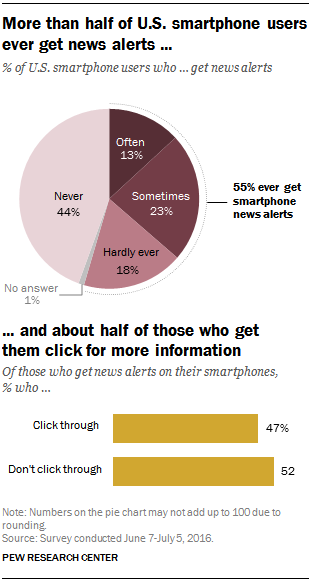 4 More than half (55%) of U.S. smartphone users get news alerts, but few get them frequently. When asked whether they take action on the news alerts they receive, about half say they click through to the full story or search for more information (47% of those who get alerts, or 26% of smartphone users overall). 5 Social media, particularly Facebook, is now a common news source. Overall, 62% of U.S. adults get news on social media, and 18% do so often. However, news plays a varying role across the social networking sites studied. Two-thirds of Facebook users (66%) get news on the site, which amounts to 44% of the general population. Nearly as many Twitter users say they get news on Twitter (59%), but due to Twitter’s smaller user base this translates to just 9% of the general population. 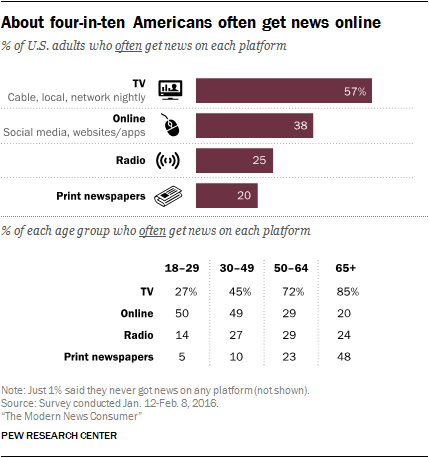 6 Overall, more digital news consumers get their news online in the process of doing other things online (55%) than specifically seek out the news (44%), though there are differences by social media platform. About six-in-ten YouTube (58%), Facebook (62%) and Instagram (63%) news users get their news online mostly by chance while they are online doing other things, and they are less likely to say they were looking for news. 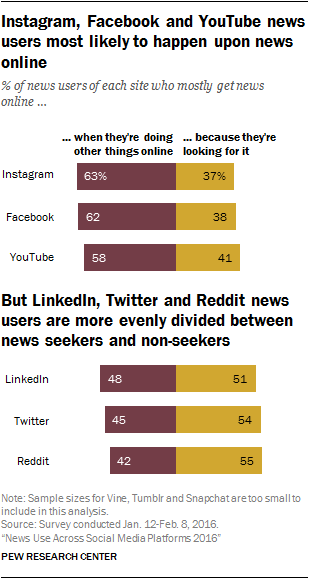 However, Reddit, Twitter and LinkedIn news users are just as likely to say they seek out news online as to say they happen upon it. 7 Few Americans trust social media as a news source. 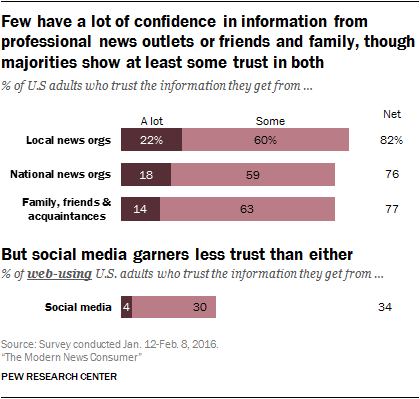 Only about two-in-ten Americans (22%) trust the information they get from local news organizations a lot, whether online or offline, and just 18% say the same of national organizations. But large majorities say they have at least some trust in both. This is not the case for social media, however. Only 4% of web-using adults have a lot of trust in the information they find on social media, and just 34% say they trust it at least some. 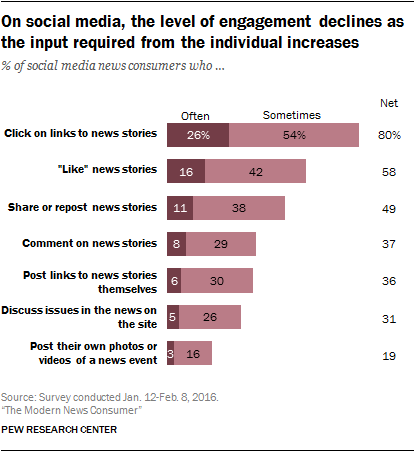 8 While many Americans get news from social media, few are heavily engaged with news. Only about a quarter (26%) of social media news consumers often click on links to news stories on social media. And only 16% often “like” news stories. Even fewer say they often comment on (8%), share (11%) or discuss (5%) news stories on social media. 9 In the digital news environment, the role of friends and family is prominent – and for some it’s an echo chamber. Among online news consumers, conservative Republicans and liberal Democrats are more likely than more moderate members of each party to say the news they get from family and friends online represents just one side. 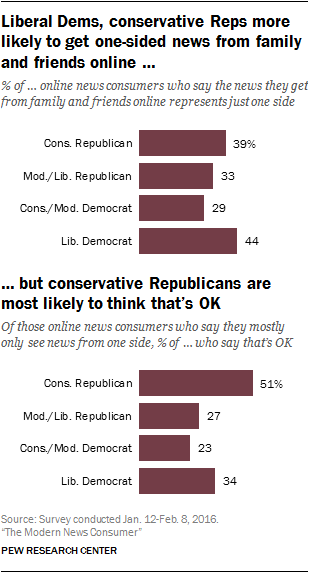 And about half (51%) of conservative Republicans who said they see mostly one-sided news say this is OK – a larger share than among all other political groups, including liberal Democrats (34%). 10 Three-in-ten Americans turn to 2016 presidential candidates’ digital messages for news and information about the election – and the candidates’ social media posts outpace their websites and emails as sources of this news. 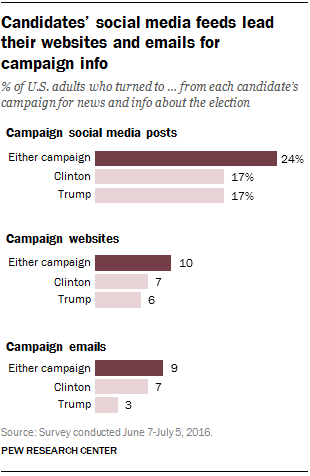 Roughly a quarter of U.S. adults (24%) turn to social media posts from either the Hillary Clinton or Donald Trump campaigns as a way of keeping up with the election; this is a higher share than say they turn to the candidates’ campaign websites (10%) or emails (9%). While all age groups rely more on campaign social media communications than their emails or websites, young adults are the most likely to do so: Nearly four-in-ten (37%) of those ages 18 to 29 turn to candidates’ social media accounts, compared with 28% of those ages 30 to 49, 19% of those ages 50 to 64, and 11% of those age 65+. Kristine Lu is a research assistant focusing on journalism research at Pew Research Center.